So by now, I imagine many of my readers are asking: "Where's the old-school fantasy gone?" 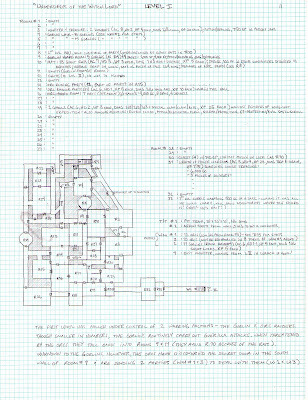 Most of the dungeons I made during this time were mapped using the random dungeon generation tables in the appendices of the first-edition Dungeon Master's Guide, and stocked using the dungeon-stocking rules of the Moldvay Basic D&D book and the monster encounter tables of the Rules Cyclopedia. They also - although being randomly stocked - usually displayed at least moderate levels of Gygaxian naturalism. Although I haven't closely examined this dungeon recently, I believe Underdeeps is a prime example of this style of creation. One of the great things about old dungeon maps is that they can be reused regardless of which D&D system you're playing now. I never throw out or destroy any of my maps. Most were labours of love and I can't bring myself to part with them. Half the fun is populating the dungeon with monster and treasure. An old map lets you revisit a previous campaign idea and make it new again. What's even better is if your players recognize the map. It will give them a false sense of confidence because they "know" that the next two rooms are completely empty. I always kept my dungeons in notebooks along with all the other game info. A couple of years ago I dragged out the couple of dozen books. At that point I was thinking I might be done with gaming, and tossed out most of the notebooks, keeping only a coupe that had important world info in case I ran again. So many of my old dungeons and locations will need to be redone if they are revisited in my current campaign. The players are on their way to an old dungeon of mine, but in redoing it I can consider it a bit of a retcon. This is very cool. I can easily see myself running the dungeon from these notes. that was the best thing I have seen in a long while. Very nice! How do you get the graph paper to scan so nicely? I've fought with my scanner but just can't get such clear results. @Ameron: I was a map-making fiend back in the day, and still have them all, regardless of skill level (as the scanning project has already illustrated). Many of them have made return appearances, so to speak. @Lord Kilgore: I didn't do anything special when scanning these - they were scanned using (I believe) the default settings of my Epson 3-in-1. I'll confess to using your three-map 'waterfall' complex -- the PCs only explored the first level, and then the island they were on decided to rejoin the mainland so they cut-short their expedition. I loved the bizarre layout of that one, and I learn a lot from looking at these others you've posted. I find it really amazing that people are getting play out of these. As I've mentioned before, I really only posted them as curiosities of nostalgia - I hadn't expected anybody to actually make use of them. You know, I think that it is the graph paper. I looked at those, saw the very crisp lines, saw a lovingly-drawn dungeon full of imagination, and it conjured-up some really positive gaming energy.